Bono and Revo Join the Fight Against Glaucoma. It is estimated that more than three million Americans have Glaucoma. However, less than half have been formally diagnosed. Glaucoma is a condition that damages the optic nerves in your eyes. The damage occurs when there is a buildup of pressure in your eye. Glaucoma tends to be hereditary and usually begins later on in the individual’s lifetime. It is currently the second leading cause of blindness and as of yet there is no cure for this condition. For now, Glaucoma is treated with pills, eye drops, laser trabeculoplasty, or surgery. Early detection is important in order to help delay the progression of this condition. 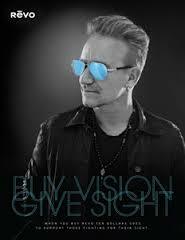 On July 23, 2015 U2 lead singer Bono and Revo, the performance eyewear brand, have announced their “Buy Vision Give Sight” campaign. This is a very personal campaign for Bono, who was diagnosed with Glaucoma twenty years ago. His personal experience with this disease has encouraged Bono to help in the fight for others’ sight. This campaign will raise money to help in the prevention of Glaucoma in underprivileged areas all over the world. With every purchase of a pair of Revo sunglasses, the company will donate $10 to the campaign fund. Revo plans to donate up to $10 million dollars over the next five years. These donations will increase access to eye care and prescription glasses in impoverished communities. During U2’s upcoming Innocence + Experience world tour, Bono will exclusively wear Revo sunglasses. Bono has designed a capsule collection with Revo in 5 styles, which will debut this fall. He will also be featured in many of Revo’s ads and campaign material to promote the Buy Vision Give Sight endeavor.